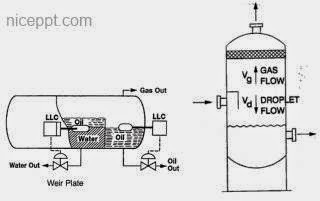 Separator vessel is media that used for separating fluids produced from oil and gas well into gaseous and liquid component. Separator vessel actually can be divided into two type, test separator and production separator. The main function of test separator is to measure flow of production from well head, so the factory can predict how much capacity from well in unit time. Different with test separator, production separator main function is to separate oil and gas and the result will given into other process. Separator vessel also can be divided by geometrical configuration. As the result, we will have vertical separator, horizontal separator, horizontal double barrel separator or spherical separator. And by their function, we will have two phase, vapor-liquid, and three-phase separators. That is one of content in this powerpoint that I will share. Talking about this powerpoint, I think the content is complete, because it's taken from book. 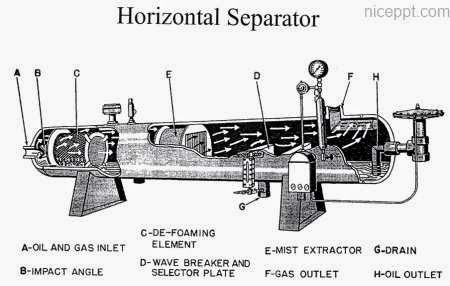 One by one about separator will explain in detail, including vertical or horizontal separator. And about the animation? There are no animation, and one more thing the explanation use image mode that make this powerpoint have big size, around 100mb. So it’s some kind of capture form pdf or photo, and put in powerpoint. What make this special, I think the content. The content will explain from component separator, part per part will show, mechanism and also how instrument work. And the other thing that will explain, this separation powerpoint will explain to you about comparison between vertical and horizontal vessel. For review, vertical separator vessel will use when sand, paraffin or wax are produced, spacing is limited, small flow rate, ease of level control is desired. The advantages separator vertical than horizontal is more versatile than horizontal, liquid-level is not so critical, have good bottom-drain and cleanout facilities, and has full diameter for gas flow at top and oil flow at bottom. Everything will explain in this powerpoint, so just download it if you need to study separator vessel. I recommend to you.